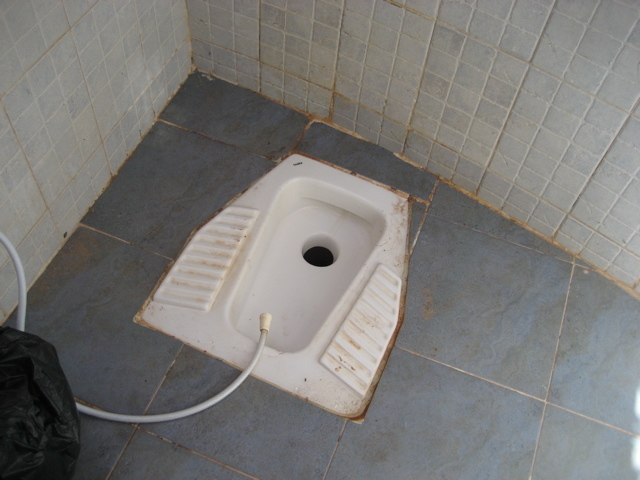 The eastern squat toilet is the world’s perfect eco-toilet. Come and look inside. Some people think they’re primitive, but I love them. The hole-in-the-floor Middle East squat toilets can be found in Turkey, Syria, Jordan and Egypt –– and likely in other Middle East countries I’ve yet to visit. They’re used in China too. Contrary to what spoiled westerners might believe, squat toilets are extremely clean, are the answer to the toilet-paper-saving bidet, and in the natural squat position, our bodies are best aligned to the right position when we relieve ourselves. In short, they are environmentally-friendly. Over in Israel, water-saving buttons on western toilets mean that about half the water is flushed down the drain than what’s used in the US; but when you use a squat toilet (I’ve seen them in peoples’ homes in Syria, not just in public locations), much water is spared from going down the drain. And you never use toilet paper. You just turn on the spigot to help you wash your private parts, and make sure the area is clean for the next person. The toilet looks discolored or unclean. What you see is mainly sand and soil residue brought from the outside in. What’s essential, after the fact, is making sure you clean your hands well with soap and water in a sink; you’ll find that at rest facilities you’ll be handed paper after you leave the lavatory. That’s for drying them. 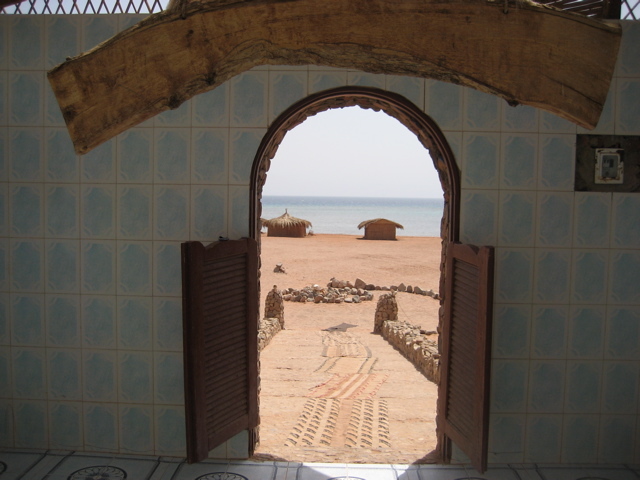 The view from the toilets looking out to the Red Sea and Saudi Arabia. 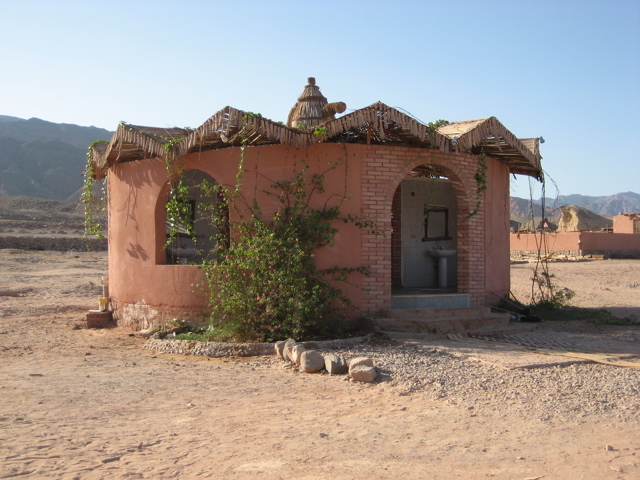 At this particular place we were in at Sinai (Kum Kum 3), water runoff from the sinks and showers went to watering plants outside the bathroom areas. A great idea for recycling water at one of the driest places on Earth. 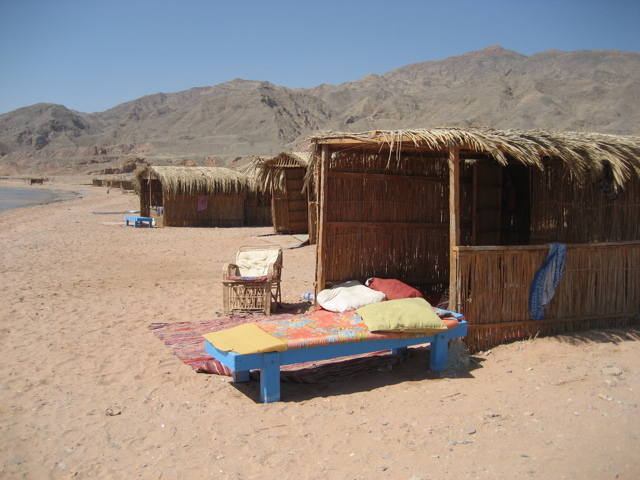 Our bare bones, low-impact desert hut. No running water. No electricity. No air con with nights so hot you feel like you are in a tumble dryer. All photos: Karin Kloosterman. Free to use with link back to Green Prophet. I wish it was safe to travel in Sinai these days. I think the most difficult thing people inexperienced with squat toilets contend with is how to drop their drawers and keep them out of the line of fire, from either end. 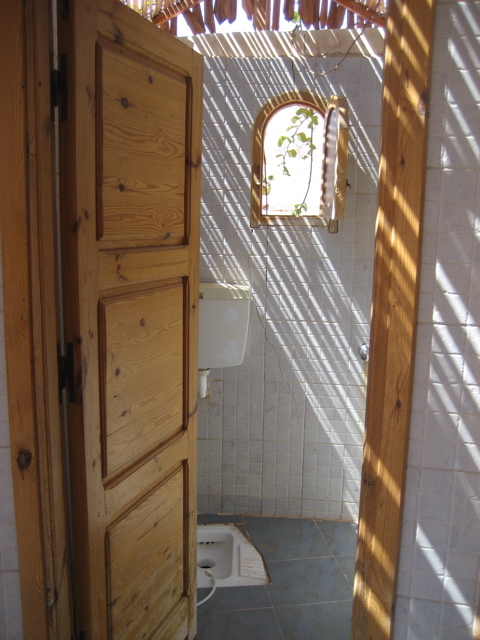 Many European toilets over here in the Middle East come equipped with a side hose, so no need for an extra bidet. The pig business happened to a friend of mine . . . and he said the pigs chased after him wanting more! Guess that’s why Jews and Muslims won’t eat pigs. It’s quite gross to eat an animal who consumes human feces, no? It feels a bit like cannibalism. In china, Squat tiolets are actually positioned over a pen of hungry pigs?? ?